Authentic Thai Pad See Ew Recipe (ผัดซีอิ๊ว) - Street Food Style! 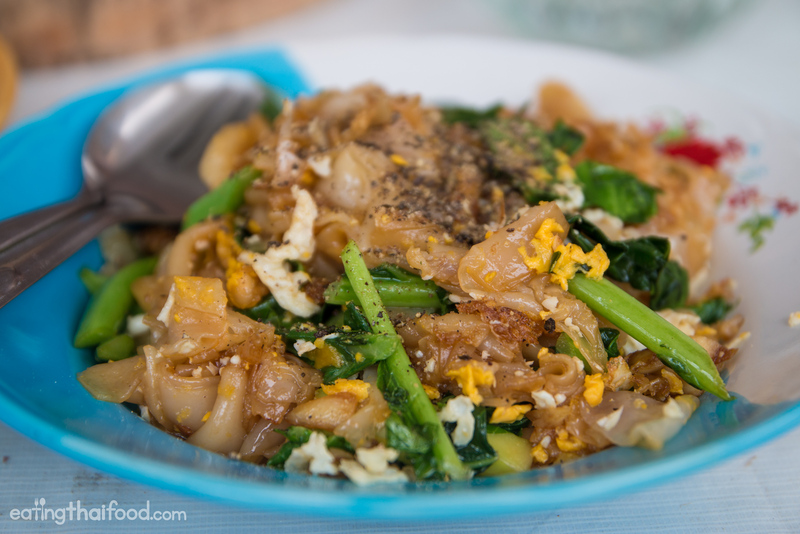 Pad see ew (ผัดซีอิ๊ว) Thai fried noodle dish that’s extremely popular as a quick street food meal in Thailand. In this pad see ew recipe, you’re going to learn how to make an authentic version of pad see ew (ผัดซีอิ๊ว). Note: If you want to get straight to the steps and directions, scroll down to the recipe box below. Or keep reading for more of an in-depth explanation of the ingredients used for this pad see ew recipe. 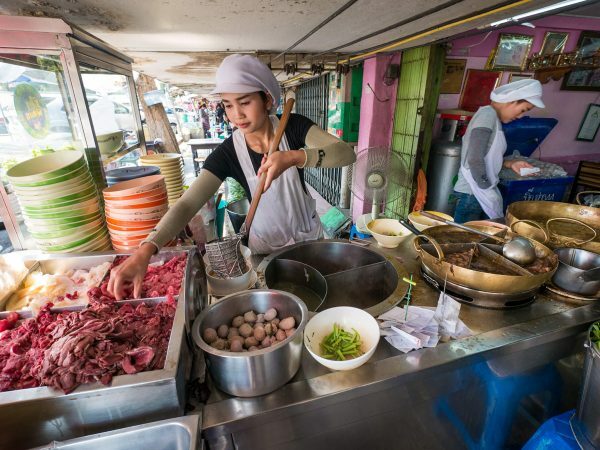 The main ingredient in every plate of pad see ew (ผัดซีอิ๊ว) is sen yai, wide thin rice noodles. In Thailand you can purchase sen yai for this recipe at any local market, and they are available fresh and sold by weight. 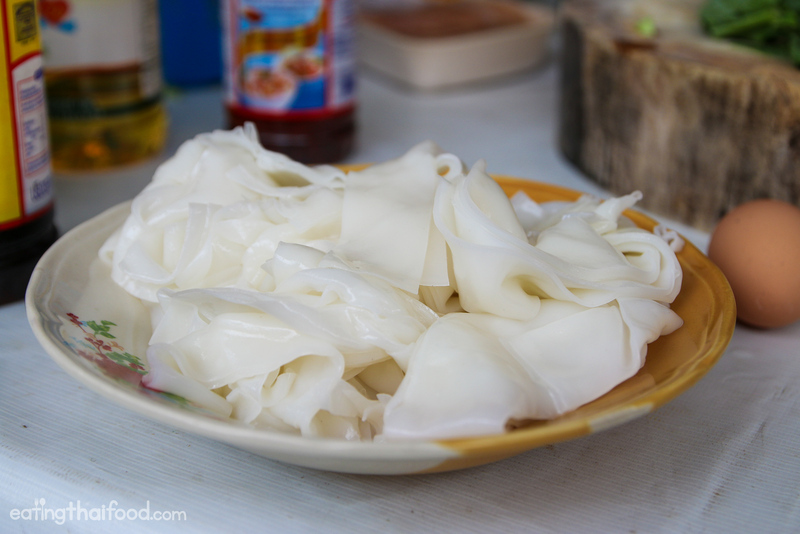 In other parts of the world, you can probably find fresh wide rice noodles at most Asian supermarkets in major cities. 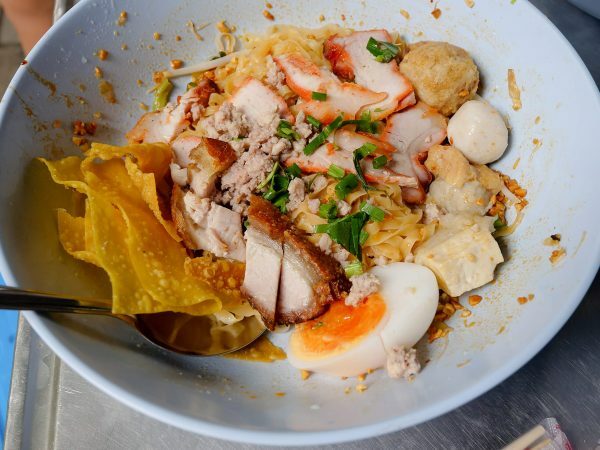 The Thai sen yai noodles might not specifically be available, but you can substitute the Chinese or Vietnamese versions of thin wide rice noodles. Dry noodles could work making this pad see ew recipe, but really try to find fresh noodles, as your pad see ew will taste much better. Another key ingredient in any pad see ew recipe is a green leafy vegetable, called pak kana in Thai, which is almost the same as Chinese kailan or Chinese broccoli. 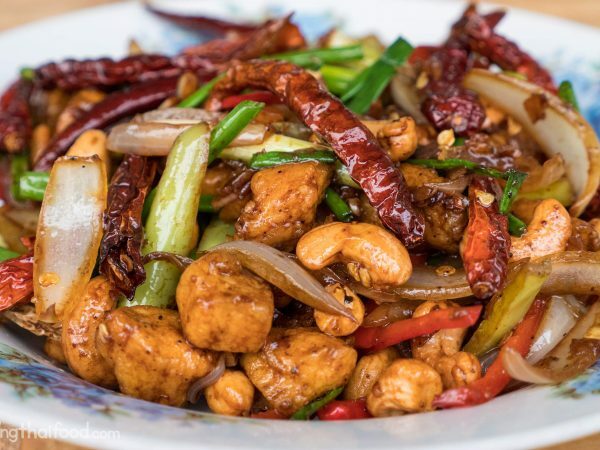 Additionally, pad see ew is usually made with chicken or pork, but you can really choose whatever meat you’d like to go with this recipe. 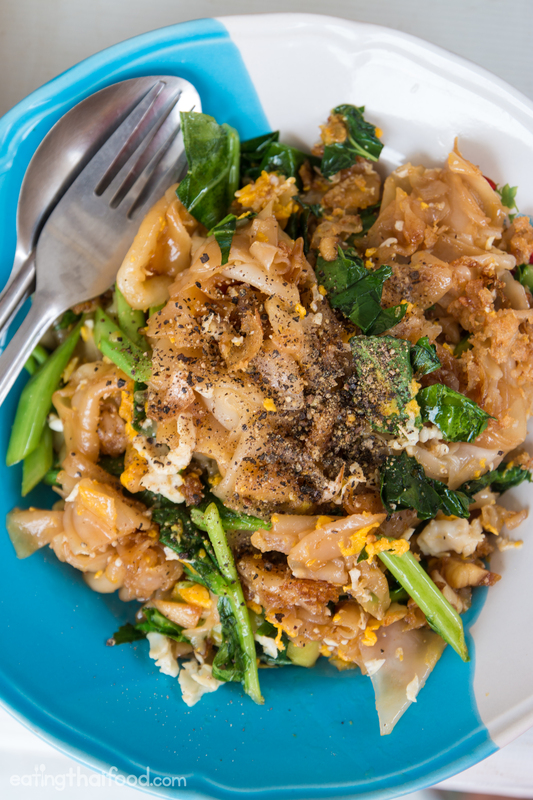 There are a couple of main seasonings you’ll need for this pad see ew recipe. You’ll need both light soy sauce and dark soy sauce. The light soy sauce gives a saltiness to the noodles, while the dark sweet soy sauce will give your pad see ew a darker color and a little bit of sweetness. For this recipe, I usually use Golden Mountain soy sauce, and for the dark sweet sauce I use a Thai brand called Yan Wal Yun. However, I haven’t seen that brand outside of Thailand, but you can substitute for an Indonesian sweet soy sauce. Overall, this is a pretty easy pad see ew recipe (ผัดซีอิ๊ว), but the hardest part of making it is working with the heat of the wok – too low and you won’t get a good smokey taste, and too high and you’ll burn the noodles (I’ve done it many times!). I explain more about the method of cooking pad see ew in the video instructions below and through, but I normally begin on a medium heat, and then when I add the noodles I change to a low fire for a little bit, and finally at the end of cooking, just before adding the egg, I crank up the fire to a high heat to get some wok hei (at least try to). As with so many Thai stir fry recipes, being in control of the ingredients with varying levels of heat is so important. Note: It’s also worth noting that it’s very difficult to use an electric stove to make good pad see ew. If you don’t have gas, another option is an outdoor grill, or you can use this chimney starter hack. Eat it with: Pad see ew is a one plate meal, fried noodles that includes meat, egg, and a green vegetables. It especially makes for a great lunchtime dish. 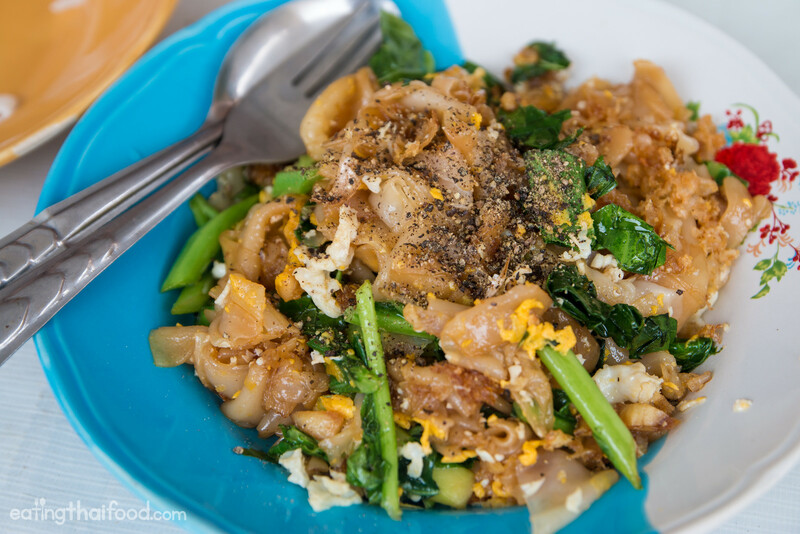 Pad see ew (ผัดซีอิ๊ว) is a widely popular fried noodle dish in Thailand. The wide rice noodles are combined with Chinese broccoli, chicken (or other meat), and egg, and seasoned with soy sauce. 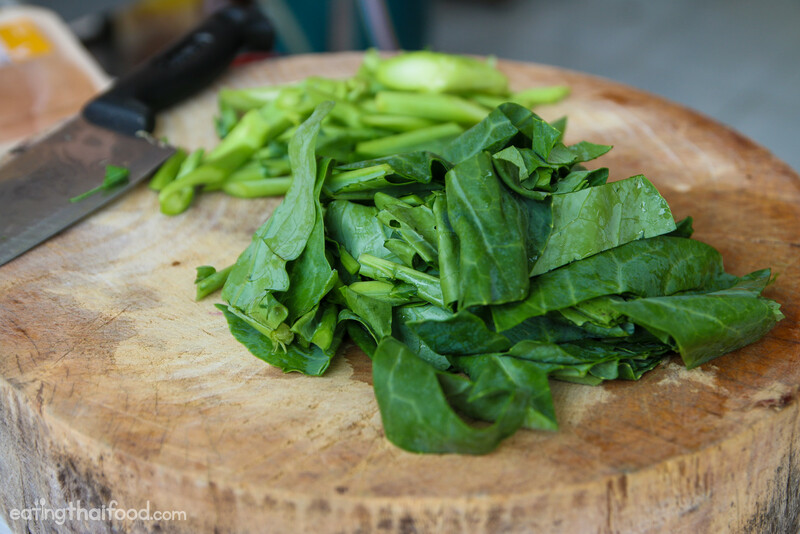 1 handful of chopped Chinese broccoli (kailan) - I used about 2 stalks for this recipe. Comb through the fresh wide rice noodles, making sure any clumps are separated. Peel then mince 3 cloves of garlic, slice the chicken into small bite sized pieces, and slice the Chinese broccoli into 1.5 centimeter strips. Heat the wok (or frying pan) on a medium heat and add about 2 tablespoons of oil. Wait until the oil is hot, and then fry the garlic for about 10 seconds or so, making sure it sizzles in the hot oil. Add the chopped chicken to the wok and stir fry for it about a minute until the chicken is nearly all the way white in color and cooked pretty well though and through. Now, turn down your heat (or if you’re using an electric stove you can even move your pan off the burner for a moment). Toss in the rice noodles, the Chinese broccoli, 1 tablespoon of light soy sauce, ½ tablespoon of dark soy sauce, and a ½ teaspoon of sugar. Still on low heat, start to fold the noodles gently by picking them up with the spatula from the bottom, and folding them over (If you stir fry too hard, the stickiness from the noodles can make them turn into a big noodle blob - believe me, I’ve done this too many times and it’s not pretty!). Cook the noodles for about 1 -2 minutes. If it gets a little dry, you can drizzle in a tiny bit of oil. After the noodles are well mixed, scoot the noodles to one side of the wok, and proceed to crack an egg into the empty side. Now it’s time to crank up the heat on your stove - for the final step we want a little char on the noodles and egg for great flavor. Scramble the egg, and then fold the noodles onto the egg, sort of when it's half cooked. Let the heat sear the egg for a few seconds and then start folding the noodles and egg together. With a hot flaming fire, you should get a little char to both the noodles and the egg. Fry for about 30 more seconds, making sure to be gentle with the noodles, and then turn off the heat and dish it out. Sprinkle a little freshly ground pepper on the top of the noodles. You can also eat pad see ew with a bit of chili flakes on top and some vinegar for taste. This pad see ew recipe (ผัดซีอิ๊ว) doesn’t take a lot of ingredients, nor is it too challenging to make. The hardest part is controlling the sticky noodles, and stir frying them from the bottom of the pan gently so they don’t clump together. The soft, slightly gooey wide rice noodles, the seared egg, the crisp kailan, and the slight char from the high heat stir frying, all combine together to make pad see ew (ผัดซีอิ๊ว) a wonderfully tasty Thai dish. Let me know what you think of pad see ew (ผัดซีอิ๊ว) in the comments below. Want to cook more Thai food? Click here to see all my Thai recipes. 57 comments. I'd love to hear from you! Your recipes are amazing! They actually work and you make them so simple and easy to follow. I had a question regarding the black sauce for the pad Thai, have you Reid the Chinese dark soy sauce or Malaysian one? It is not as sweet as the Indonesian one. I bought the noodle which came in a pack, wet ones. But it was so difficult to separate them under cold water tap as per the instruction on the packet. Most of the noddle had gone to smaller length while I tried to separate them. Any idea how I can separate the noodle easily? you need to heat in microwave until soft then separate..
Omg! Just found this site and didn’t know it was your site. Love watching your YouTube videos and I can’t wait to try out these recipes. Great recipe. Just cooked this and my wife thought it tasted very authentic. We added some salt and marinated pork, which added a ton of flavor. Do you cook the noodles before adding to the pan with everything? Hey Amanda, normally you would buy pre-cooked noodles. So you don’t cook them before adding them to the pan. Followed this recipe exactly and tasted bland and nothing like Pad see ew!! Terrible. Just made this and came up parity good and easy to cook. But for some reason I had to add salt to before eating. Wasn’t salty enough. I don’t know if it’s just me or do you need to add salt to the dish. But overall nice and easy. Great recipe & video! You make procedure easy for everybody! Final touch is squeezing a half lime on your portion. Just got back from Thailand and trying all your recipes! Tonight is Pad See Ew! The Tom Yum came out fantastic! 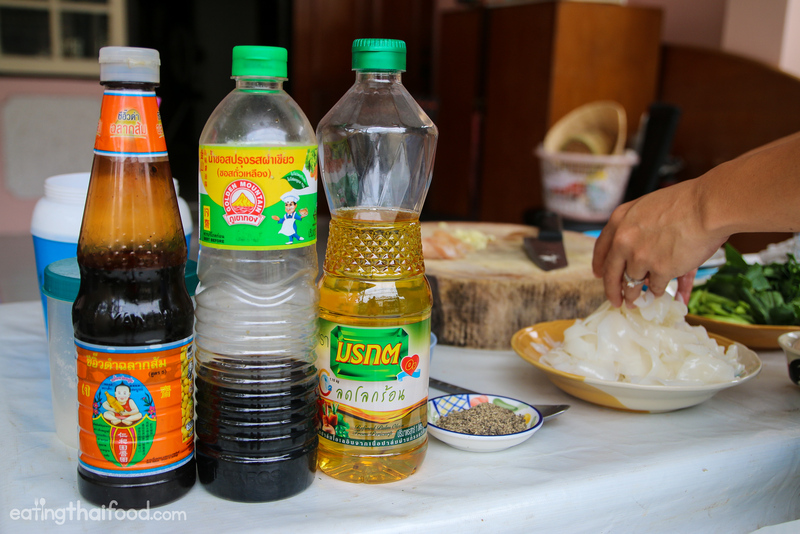 We also tried Lu Lam while in Chiangmai Rai…loved it! What I really want is to go back to Thailand for more of it all! I am always skeptical when I try a recipe off of the internet, particularly a dish I have always loved in Thai restaurants. I have to say that this dish tastes exactly as I have experienced it in recipes, and is a snap to make. I used the sweet soy sauce, which I think made a big difference, and substituted broccolini for the Chinese broccoli. I also used the wide rice noodles. Absolutely fantastic, a snap to make. Can’t wait to try more of your recipes. Just cooked this tonight. Best authentic recipe. Keep it up! Can you cook rad na next, please? ???????????????????? 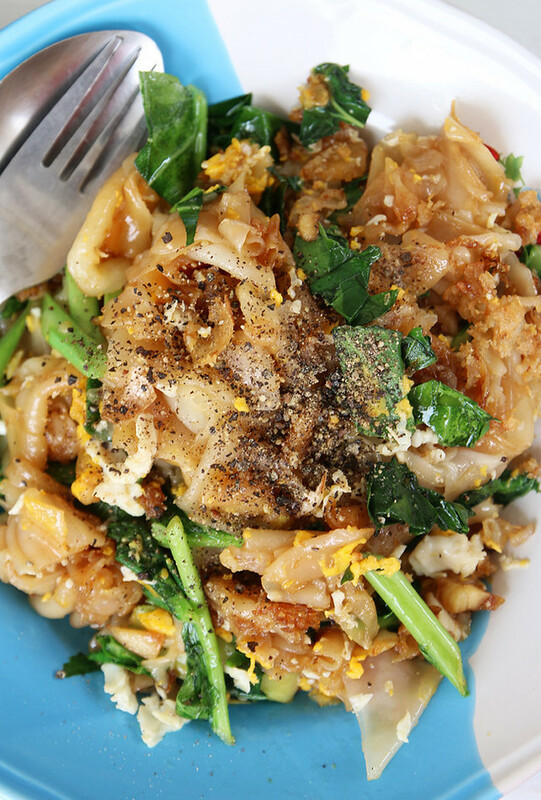 One of favorite – Pad See Ew, sounds simple and delish. Thanks, and have a recipe for Angel Wings, one of my other favorites. Hi Ann, great to hear that, glad you enjoy it! Hi I was just wondering if the dark soy sauce was kecap manis? Hey Kavin, yes I think it’s pretty much the same. You could use kecap manis. I wondering if you know a kindly of thai fried noodles similar to pad see ew, also using sen yai but more moisture soaked in a sauce (not soup). Is it difficult to make one? Hi Trista, hmm, I think you might be thinking of sen yai radna? The wide rice noodles in a gravy sauce? Fabulous recipe. Found the Youtube Video and watched that before cooking. So easy to make – and so delicious. Just had it for lunch – and will definitely make it again. Thanks Mark! Looks like a great – and uncomplicated recipe – will definitely try to make it – thanks. … And I live your food writings and videos. I usually use a little good-quality oyster sauce, too. I love the depth of flavor, and how it sinks into those noodles. True comfort food. Hey Jane, that’s a great tip for the oyster sauce. You’re welcome, glad the recipe are helpful! 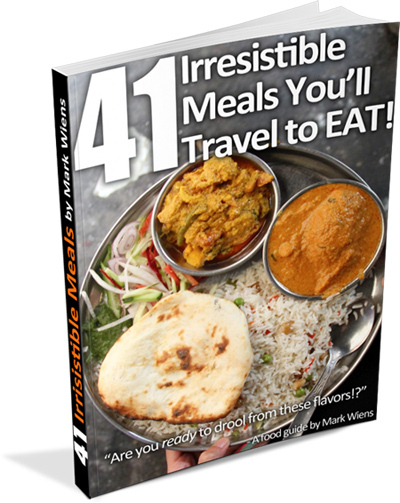 Hello Mark, my kid is asking for non-indian vegetarian recipes. Do you have suggestions on how to make a vegetarian version of this recipe without using mushrooms? Hi Jagadesh, for pad see ew you could really make it with whatever you like as long as you have the noodles. No need to use meat or mushrooms. Enjoy! Thanks again. And good luck with the tv program in Thailand. Great to hear that Tom, hope you can find the noodles. All the best with the cooking! Thank you. Hey mark, love the videos and I am so jealous that you get to do all these amazing things! I was just wondering what substitutes you could use for things like Chinese broccoli. I think it would be very helpful if you mentioned what substitutes could be used in all your videos because it would allow more people to try and make these dishes. Thank you for the tip Rob, and good suggestions. I think for Chinese broccoli you could really substitute any kind of green leafy vegetable – maybe mustard greens or collard greens might work well. I substituted Baby Bok Choy and it was fantastic. I also had to substitute dry rice noodles that were a bit thinner than I wanted and it still turned out great. Hi Marty, thank you for sharing, glad it turned out great! My local Thai restaurant uses regular broccoli in their pad see ew and it’s fantastic. I would imagine that kale would be good in in as well. Hi Milly, thank you for sharing. Yes, I think kale or broccoli would work very well. Maybe Mark should do all Thai halal food recipe like Gurumeh Peh and Khaomok Gai/Beef. Hey Kitti, good to hear from you. I would love to make gurumeh peh, do you know how to make it!?? But you can look at FoodTravelTVChannel on youtube. I think they have a recipe for กรุหม่าไก่ “Chicken Gurumeh” and ข้าวหมกไก่ ข้าวหมกเนื้อ. Ok, great not problem Kitti, and thank you.